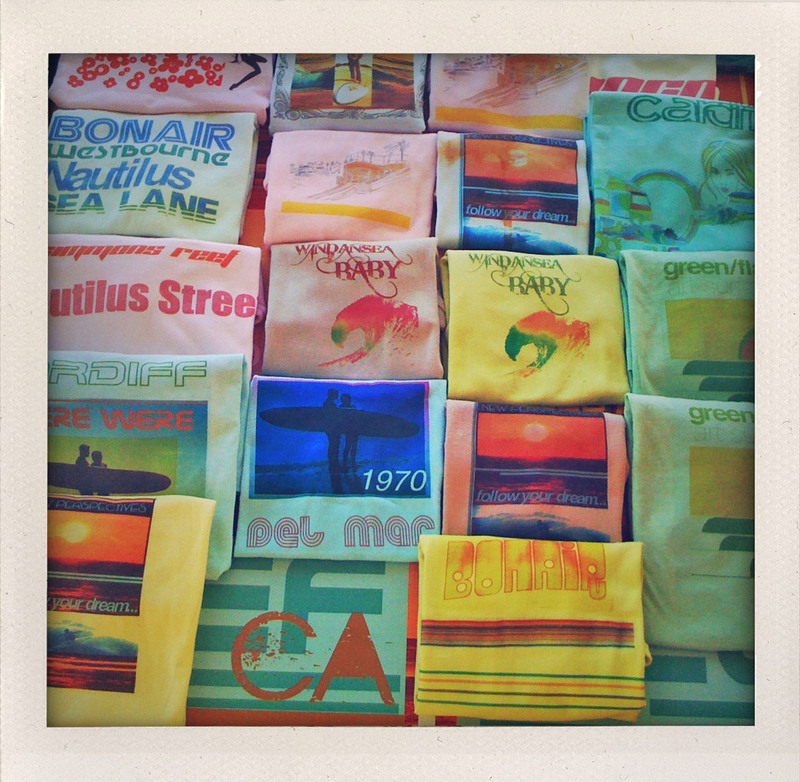 The Green / Flash Surf Art Gallery in Cardiff-By-The-Sea, California is a self-described “surf art spot.” It burst onto the scene in the summer of 2010, and has since become a permanent fixture in the North County San Diego community. Featuring art and shows from Thomas Campbell, Barry McGee, Chris Del Moro, Matt Beard, Grant Ellis, and Heather Brown to name a few, Green / Flash is proving itself to be community focused and diverse. The cozy gallery is nestled directly in the town of Cardiff, overlooking San Elijo and Cardiff Reef. Kris DeGrazio and Ashley Francomb are the founders, originally hailing from La Jolla with some time in New York, and have since acquired the help of Marta Karwowska. I had a chance to catch up with the three ladies to talk a bit about the gallery, their upcoming shows, and their focus for the future. When did Green / Flash open up? Kris Degrazio: It opened June of 2010. It’s pretty new, it started out as a pop up gallery concept, and now it’s a full gallery. It survived the pop up phase [laughs]. Was the pop up here in Cardiff? Kris: Yeah, it was here. We were thinking we’d only do it through the summer. We just weren’t sure. The opportunity sort of fell into our lap, and we went with it, and we’re still here. We had done an art show called “Blue Realm” in this space that was only a four day show, and once we took it down the landlord said the space was empty, and so we developed Green / Flash in this space. Why Cardiff? What’s special about this place to you? Kris: It’s just such a quaint community. It feels small, which is nice. It has so much character. And I feel like this is a real epicenter for surf art. Marta Karwowska: It feels like a village. Kris: [laughing] Yeah, an art village. Is this the first time you’ve run a gallery? Kris: Yes it’s the first time. We have experience in clothing design. My sister, Ashley Francomb, and I both collaborate on a clothing line. We’ve had shops [Ashley Francomb clothing label] in SoHo and La Jolla, and we sell our product here in Green / Flash. So we have retail experience, we’ve just never had gallery experience. This is our first gallery. Tell me a little bit about the clothing line. Kris: We do it together, but it’s under her name [Ashley Francomb]. Ashley Francomb: Yeah originally I started the line in New York, and then when I moved to California to go into partnership with my sister, she actually exposed me to [surfing]. We photographed all the female surfers on the big island of Hawaii during a contest. And that was a pivotal point. I was super inspired by surfing, and that’s how we got into defining the line as more colorful and surf related. And travel…originally I was doing Jamaica, Bahamas, and Bermuda. So we merged the travel and the surf themes. Kris: Yeah, [surfing’s] the main theme. And we want to develop a whole line in here based on surf spots. What was the influence or story behind the name “Green / Flash”? So you and your sister run the gallery? Kris: Yeah, with Marta, yeah. Marta, how did you get involved with Green / Flash? Kris: And she’s one reason we’re still here. With her help and her expertise, and her support. She’s really the third wheel of all of it. Ashley: Yeah it would have been really hard without her. Ashely: Well, she came at the right time. I think Kris and I were really into planning the summer shows when it was a pop-up concept. But then having Marta come in when she did solidified more of a long-term situation here. Kris: Yeah, we were launching our clothing line at the same time, so we needed our help. Surf art is the main focus? Kris: Surf and ocean art. And we’re doing a tangent with the street theme coming up, and there’s also a yoga show following the street one. So that’s going to be a little different for us, branching out a little. But our roots will always come back to the ocean surf themes. How many shows have you had so far? Kris: Right at the beginning when we had the pop up we’d try to do one every two weeks because we didn’t know how long we’d be here. And that’s a lot. So right after summer we slowed it down to once a month. We’ve had at least 10. What are some of the other events you’ve had here? I know you’ve had yoga so far. Kris: Right, that’s new. And we really wanted to have this be about yoga, surf, and art. Probably the order is… art, surf, yoga. [laughs] [We have] Lauren Duke, who was formerly of Yoga Swami–the Yurt–unfortunately that got shut down. We’ve been begging her forever to do yoga here. But because the Yurt got shut down she was able to come here and do yoga. And it’s great, her classes are really popular. Ashley: Yeah, we have donation Yoga now, and we support the local artists, and we like to think of it as a hip community house. Kris: That’s why we had “French Riviera in Cardiff” night, and we’re going to have Café Night, and Open Mic night. We want people to almost feel like they can hang out here with us. We definitely want it to be a place where people come hang out, because there’s a lot of great energy here. Tell me a bit about the next show that’s coming up, the “Surf To Street” show. Kris: Yeah she’s bringing in a different influence, which is nice. It’s pretty cool because you don’t usually see that too much here. Marta: Especially up here, you never see it. But San Diego, actually, is like a mecca of urban artists. A lot of the really well known urban artists in LA and New York kind of come out of San Diego, get their start here. So it was like a no-brainer to me. And the space is so nice, and it’s such a different feel, and I thought it would just be cool to change it up a little bit. You’re getting a different kind of crowd. Kris: Yeah that’s we like to do with shows, we try to attract different crowds. What kind of a process was it putting together the show? Marta: Well, you start out by kind of thinking about what you want the feel of the show to be, and then you start researching what artists…and then you start contacting the artists and inviting them, and the little logistics and behind the scenes agreements. Clean up the whole gallery, paint it, get it all ready. All the marketing’s a lot of work too, a lot of local marketing. Walking around with flyers, facebook. It’s a big process, but it’s really nice to see it all come together. It’s very rewarding. Did you work on the last couple of shows? Marta: I’ve worked on the last two shows, The Last Frontier and Harvest Moon. And this will be my third show. Yeah I went to The Last Frontier. It was really fun. That was a good turnout I thought. Kris: Yeah it was, and Harvest Moon was even bigger. Every show actually has gotten bigger. Do you feel that there’s a lot of momentum? Kris: Yeah, there’s tons. Everyone knows about it already, which is a neat feeling. If art, yoga, and community movie nights aren’t enough to make you check out the gallery, there is even a Green / Flash beauty line, created by Gina of Sambara soaps, with various beach and surf inspired scents. They also collaborated with Sara Elizabeth who does a Green / Flash jewelry line with green beach glass taken from local beaches. Marta is also doing a jewelry line that is available in the shop called Trawka, which means “grass” in Polish. She handmakes each piece using all metals such as gold, sterling silver. Upcoming for Green / Flash will be a Tyler Warren show in the spring, as well as a Chris Del Moro and Todd Glaser collaboration. They are planning on doing an Andy Irons visual tribute, as well as a solo show with Heather Brown. Yoga for Hope on March 4th will be their next show. Look for something fun from Green / Flash during Cardiff’s 100 year anniversary in the summer as well. Check out the Green / Flash website, as well as their blog. Be sure to head down for the opening of Surf To Street on Saturday, February 12 from 5pm – 10pm in Cardiff, CA. Check out more about the Ashley Francomb clothing line. Great concept and I wish you guys were doing this when I was living there. There used to be a hangout in Cardiff called Miracles Cafe. The place was so cool it transcended the owners. The surf spot T shirts are a great idea and you should do them as a collection country by country, such as Indonesia, Costa Rica, Mexico, etc etc. or area by area. North Cal and South Cal. Have you guys heard of Tony Lenord or John Coopwood (now here in Costa Rica but from Cal)? Both excellent surf artisits (Tony live in Encinitas).